Grampians Helicopters offer joy flights, scenic tours, food & wine tours, lunch & picnic tours plus custom tours and private hire for all kinds of special occasions. Grampians Helicopters can take any person over 3 years with a minimum of 2 and a maximum of 3 people on every flight. Their beautiful R44 and experienced pilot will treat you to amazing sights from above and great commentary of the area. 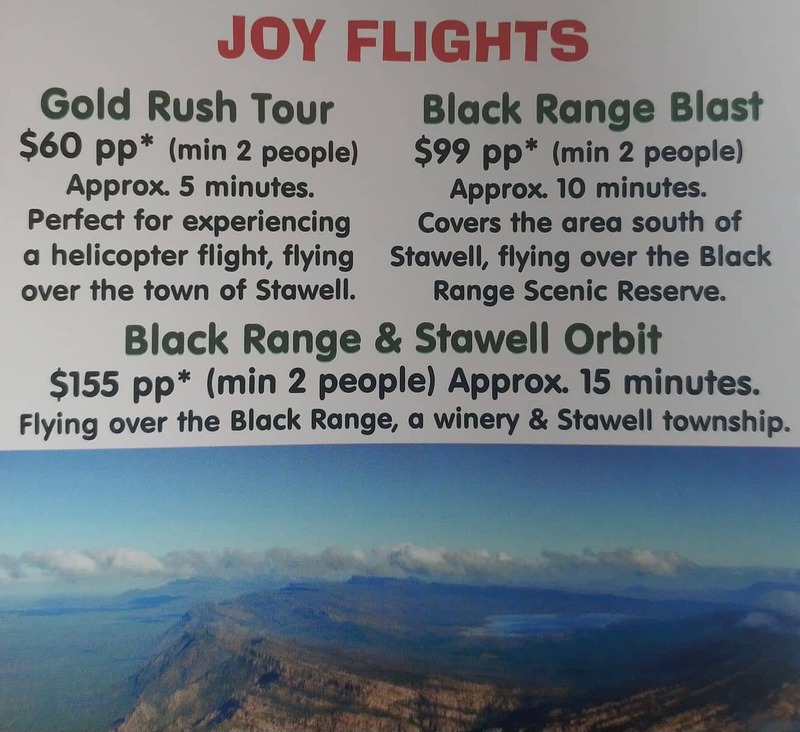 Grampians Helicopters have 3 different joy flights available 5, 10 and 15 minutes which offer visitors a taste of the helicopter and the beautiful scenery below. Their scenic flights go over the Grampians National Park – with three different flight paths to choose from. With ultimate viewing and photography options, they can even take the doors off to allow for unobstructed viewing! Grampians Helicopters land at over 10 different wineries, olive groves and accommodation places around the entire Grampians. With their Scenic Wine Tour – the most popular tour as it provides a taste of everything – see the Grampians, taste the food and wine, experience a helicopter and learn about the area from your pilot. Want to get back to nature and slow the pace down? 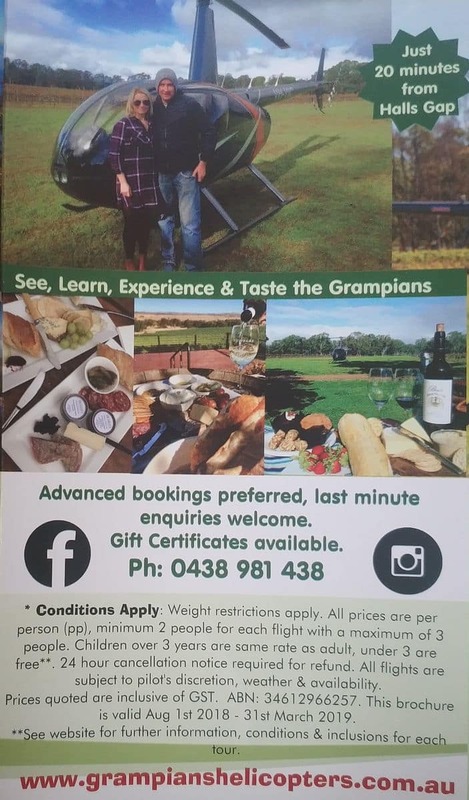 Grampians Helicopters have picnic tours with fabulous local produce. Imagine sitting amongst the local vines with your partner enjoying food and wine. Or, why not explore one of their filling lunch options. Grampians Helicopters land at two amazing restaurants, Deirdre’s in Laharum and The Royal Mail Hotel in Dunkeld. Both offering the chance to fly over the Grampians National Park and land right at the door step. All pricing on the website is inclusive of food and wine is also included in the Deirdre’s Lunch tour. They are able to provide quotes on custom tours or for private hire. Imagine arriving to you wedding in a helicopter! They receive many enquires about flying over individuals own farm/property and are also able to offer charter/film and transport work. With gift certificates available, you can surprise a loved one. Grampians Helicopters is more than just scenic flights, it offers exciting adventures, landing at hidden gems that are sometimes missed by locals and tourists. With so many flights and tours available we have something to suit everyone. Book a tour today! If you are looking for accommodation in the Grampians, click the link below to find the best deals. Cost for Silo Flight. 2 Adults Seniors. We actually aren’t the supplier or a booking company, but i have found a number of different packages and flight types at what looks to be the only helicopter company in the area. 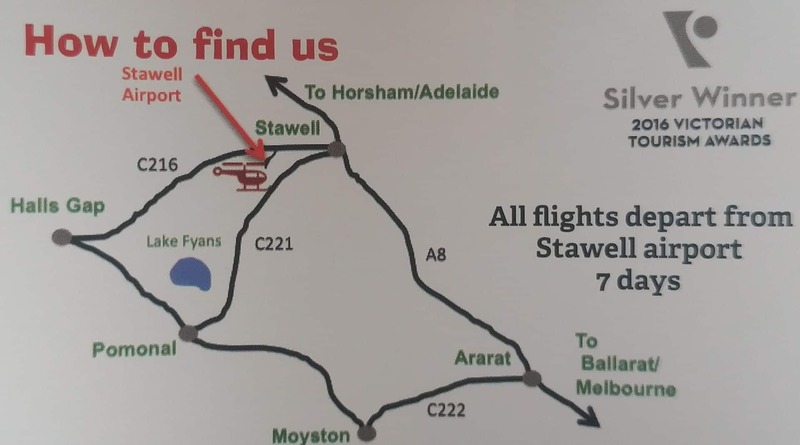 It’s hard to give you their prices because of the many different flights they have, so i would suggest browsing their website at grampianshelicopters.com.au or give them a call on 0438 981 438. How much is it per person for 15 minute helicopter ride? 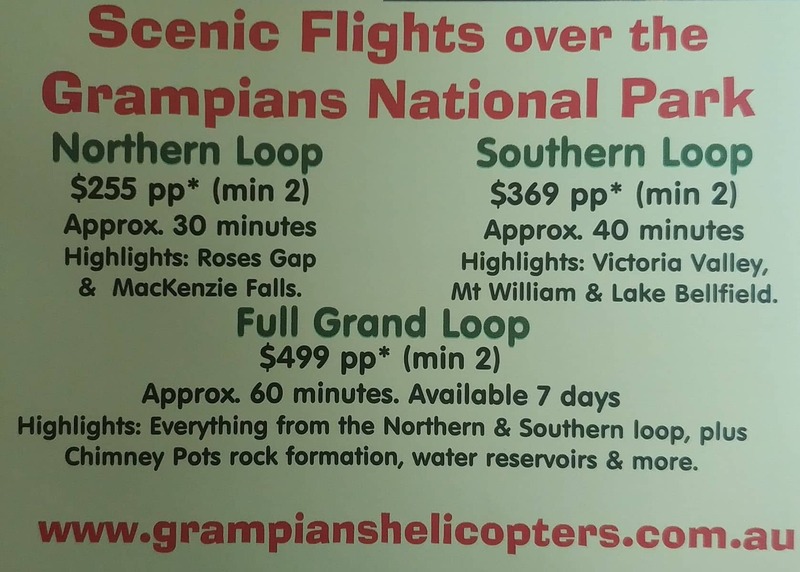 Its about $150 for 15 minutes with Grampians Helicopters.